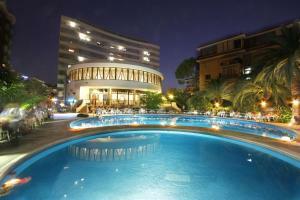 Located right in front of its own private beach, Hotel Madison is 4.5 km from the centre of San Benedetto del Tronto. It offers a restaurant, bar, and free WiFi throughout. Featuring a balcony, the air-conditioned rooms also come with a safe and flat-screen TV. The private bathroom includes a hairdryer and free toiletries. You can enjoy a continental-style breakfast daily at the Madison. San Benedetto del Tronto Train Station is a 10-minute drive away. When would you like to stay at Hotel Madison ? Air-conditioned room featuring a balcony, flat-screen TV and safe. The private bathroom includes a hairdryer and free toiletries.Please specify bed preference when booking. Each day we'll check prices and send you an email for your selected dates at Hotel Madison. If you don't have specific dates but would like to check prices for say next weekend or say next month we can check the price too. Click to write a review and share your experience of Hotel Madison with other travellers.